Q. It is quite an amazing sales growth story of Liberty. Your company has transformed the franchisee model. A. The earlier paradigm was to produce in big batches. To get rid of this stock fast we needed big orders. Hence, we either opened large stores or pursued large franchisees. The focus on primary sales through large orders resulted in huge inventory of 6-9 months at the franchisees. Consequently, the ROI for the franchisee was not attractive. It became difficult to attract good franchisees, which hampered our growth. Working with Vector Consulting Group we understood that, small and frequent supplies ensured low inventories, of about 2 months, at the franchisee. This also brought in significantly higher ROI. Q. It is quite a shift for a fashion products company to shift from forecasting for a season to weekly replenishment of small quantities? A. Yes! As it is not possible to replenish the shops weekly from the production line, we had to build a new Central Warehouse (CWH). With Vector’s help we changed the operations to ensure over 95% availability at the CWH for more than 5000 SKUs. The reduction of production lead times from 60 to 16 days ensured total inventory reduced by 50%. The next challenge was to accept the increase in logistics costs due to higher delivery frequency from the CWH. The substantial sales increase in the pilot helped us accept marginally higher logistics costs. Q. Have you thought of leveraging your success further? A. 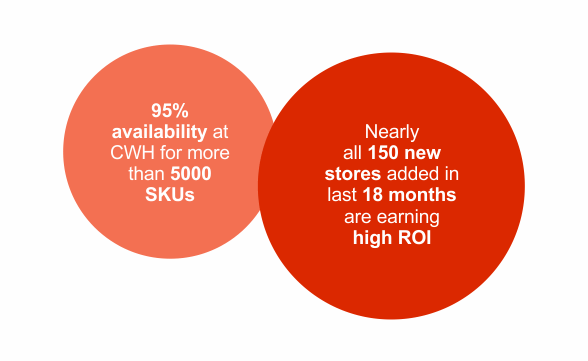 We have added 150 new stores in the last 18 months. Our capability of small and frequent supplies is a key enabler in expanding through many small franchisees and company owned stores in two and three tier cities.